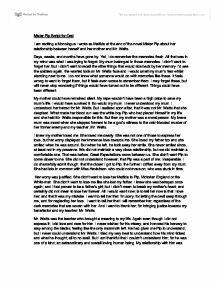 I am reciting a Monologue I wrote as Matilda at the end of the novel Mister Pip about her relationship between herself and her mother and Mr. Watts. 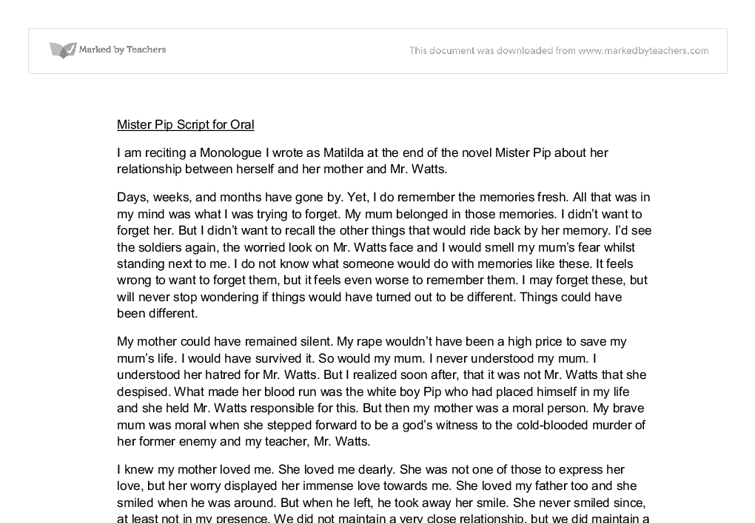 Mister Pip Script for Oral I am reciting a Monologue I wrote as Matilda at the end of the novel Mister Pip about her relationship between herself and her mother and Mr. Watts. Days, weeks, and months have gone by. Yet, I do remember the memories fresh. All that was in my mind was what I was trying to forget. My mum belonged in those memories. I didn't want to forget her. But I didn't want to recall the other things that would ride back by her memory. I'd see the soldiers again, the worried look on Mr. Watts face and I would smell my mum's fear whilst standing next to me. I do not know what someone would do with memories like these. It feels wrong to want to forget them, but it feels even worse to remember them. I may forget these, but will never stop wondering if things would have turned out to be different. Things could have been different. ...read more. But when he left, he took away her smile. She never smiled since, at least not in my presence. We did not maintain a very close relationship, but we did maintain a comfortable one. That was before; Great Expectations came between us. She didn't want Pip to come closer to me. She did not understand however; that Pip was a part of me; Inseparable. I do shamefully admit though; that the closer I got to Pip; the further I drifted away from my mum. She had lots in common with Miss Havisham- who could not move on; who was stuck in time. Her worry was justified. She didn't want to lose her Matilda to Pip, Victorian England or the White man. She didn't want to lose me like she lost my father. I knew she was betrayed once again; and I had proven to be a father's girl; but I didn't mean to break my mother's heart; and certainly did not mean to lose her forever. ...read more. But I am thankful that I couldn't understand him; for he was one of a kind; an extraordinary and overall loving human being. My relationship with him was simple; one of a father and daughter. He taught us what it truly meant to be a gentleman. He taught us that being a gentleman or a moral being was a quality; and not something that can be identified by money and social standing. He taught us that a gentleman will always do the right thing. He was my father when my real father wasn't around. He was never acknowledged for all he did but yet continued to do it. He stood by our class; and never let go. He pretended to be Pip for us. I want to thank Mr. Watts for all the knowledge he had brought me; and I want to tell him that I wouldn't ever forget him either. I will go back home someday; and relinquish these memories once again and forever will they be; scarred in my heart. ?? ?? ?? ?? ...read more. I believe that the reason why Keatley chose this technique is due to the fact that the audience is able to relate to at least one of the characters in the play whether it's through another family member of their own or themselves.